During the opening moments of survival thriller The Keeping Room, a woman is walking alone down a dirt road during the final days of the American Civil War. She's visibly tired, having presumably carried crops for some distance, but responds to an aggressive Doberman Pinscher in her path by barking back at it. The dog backs down, but when the woman looks up, a larger, unavoidable threat looms ahead. It's the Union Army, and it's gradually encroaching not just on her, but on three Southern women — the assured and resilient Augusta (Brit Marling), the stoic and reliable Mad (Muna Otaru) and the younger, naïve Louise (Hailee Steinfeld) — to which the narrative then shifts. Written by former teacher and first-time screenwriter Julia Hart, this sequence is pointed and dialogue-free, visually representing the story that's about to unfold. It's visually rich and storyboarded to perfection by director Daniel Barber (Harry Brown), capturing the silence, terror and uncertainty of the moment before breaking away to the gorgeous, yet horrifying, image of two horses fleeing with a flaming carriage attached behind them. These collective considerations and the assured craft apparent here are indicative of the deliberately paced, unapologetically stark horror illustrated by the rest of The Keeping Room. Augusta, Mad and Louise, like the woman in the opening sequence, are tired. They live to survive, working their land and sharing meals — and little else beyond this. Early scenes show them cooking, gardening and cutting wood when not having sparsely worded, but pointed, discussions about why Louise shouldn't wear the "nice" dress and how their disposition has removed class and servitude from their quotidian experience. Conflict arises when Louise is bitten by a raccoon and Augusta heads to the neighbour's in search of medicine, only to find a dead body. Worse is that an encounter with the local saloon operator alerts two rogue soldiers (Sam Worthington and Kyle Soller) of her existence, which puts her in danger — especially after they dispose of the saloon prostitute. This premise shares some similarities with Straw Dogs, but where that film was about provocation and animal instinct, indulging in genre tropes, The Keeping Room is more of a pointed drama about gender, repression and survival. Though the expected climax does arrive, the film isn't focused on it, and certainly doesn't take pleasure in the visceral component of such an experience. Hart and Barber don't ignore the tension that stems from a home invasion situation, but they also don't rely on it. Once these characters are established — all worn down and nearly defeated by the limitations of a world perpetually grinding them — their struggle to live and ward off invaders is crucial, rather than cathartic. And, for those paying attention to the opening scene, there's a foreboding sense of dread that looms even when these women successfully defend themselves. 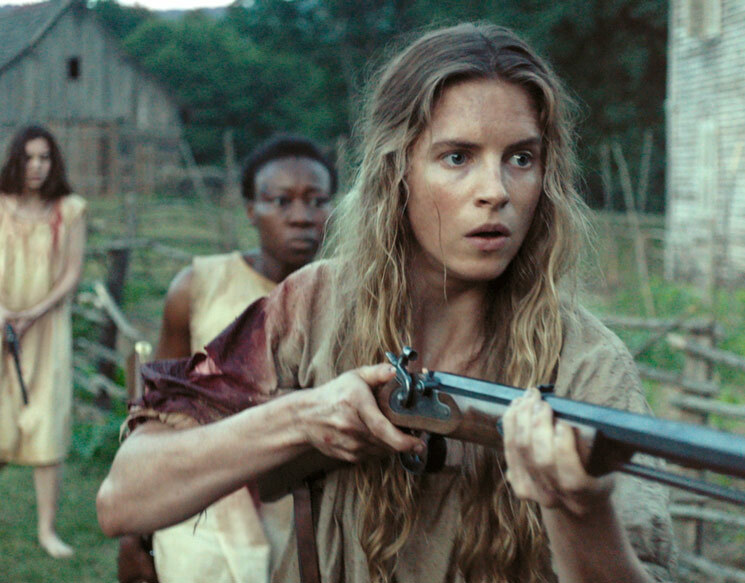 The Keeping Room isn't an easy movie to watch. Victimization and the persistent psychological ramifications of it are an overriding, even titular, theme. Some of the later events are shocking in their candour, having a casualty that suggests such horrors are ultimately an expected and shared life experience for all of these women. Though it's troubling — particularly since Hart and Barber don't extend the usual olive branch of temporary relief — it's a vital observation framed in an unusually frank manner. What does it mean to live a life in which abuse is regular and anticipated? Maintaining an impeccable sense of composition throughout, finding flawless images to freeze on and examine, the final shot of this thoughtful and heartbreaking survival film is unshakeable. Like the opening sequence, it says multitudes with just a single shot and limited action, capturing the world that these women live in without saying a single word. It's breathtaking, even though it's ultimately devastating.